The history and sociology of human beings teach us that humans do not gel along well with each other. This proposal above is interesting, but is it workable? 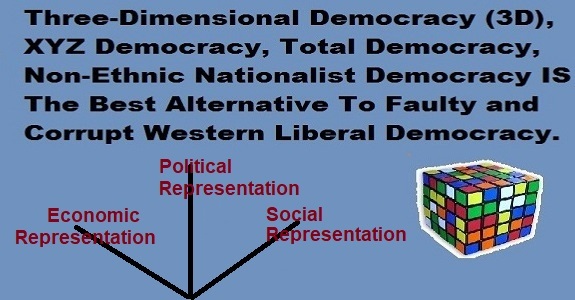 Can you have a pluralistic society with its various interests and groups and still have social cohesion? At some level, individual interests will have to be subordinated to the welfare of the group. Consider, the tribal based societies in Africa today, or for that matter in the Middle East. There is much strife and little unity. These societies can not rightly even be termed nations. Local nations are the building blocks of any nation state. And the same concept shall be considered in economy and in politics. If we look at partisan politics we could regarded it as divisive, while its not. The same applies in the social and economic domains. Without recognizing local nations, and cultures and also businesses and trades powers will never reach the people and their interests will be endangered. Sure 3DND is workable. Just each voter shall have 3 votes to select social, economic and political representatives. The assembly shall be of three chambers. Each local nation, social group, business, trade union, political party, and intellectual group shall be represented in the assembly with elected persons.